The left, in its efforts to use unreliable wind and solar on the grid, has coined a new term: negawatts, a play on megawatts. A distributed generation system is needed for wind and solar, especially where individuals can sell power back to the grid. It’s also behind the drive for combined heat and power (CHP). It has also spawned an effort for greater demand management, which is where negawatts enter the picture: Demand management is for dropping load when the grid is operating near its peak. Anyone thinking clearly will see that negawatts means no electricity. What the proponents of negawatts don’t mention is that utilities have, for decades, struck deals with their larger customers to drop load when the grid is running near its capacity. This is nothing new. It has worked well, and was part of a process for identifying where and when new generating capacity was to be built. 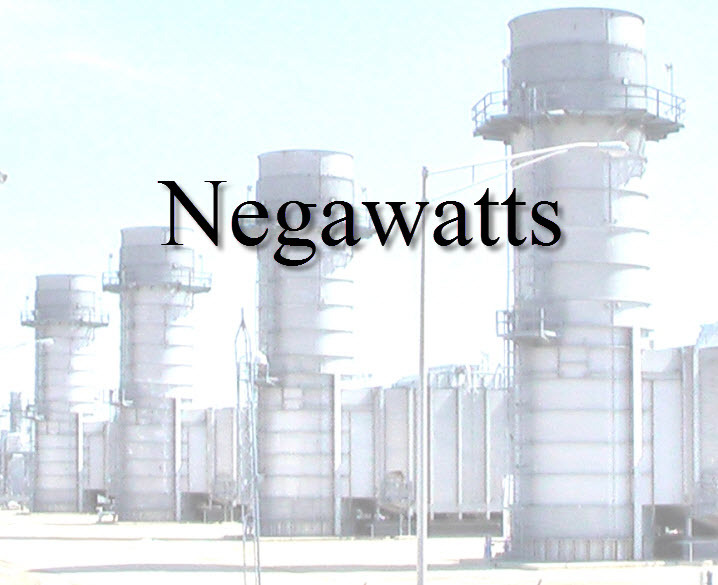 The negawatt concept, however, is being promoted as a way to eliminate load so as to not build new power plants. What proponents of negawatts also don’t mention is that negawatts don’t eliminate the need for building new power plants, they merely delay the necessity. Proponents have also sold regulators on the concept of bundling, or aggregating negawatts. Here management consulting firms comb areas for opportunities to cut back on power usage. They sign agreements with all those included in the scheme and install whatever equipment is needed to cut back on power usage at each of these locations whenever commanded to do so. For example, it’s been reported that Supervalu Inc., with 1,200 grocery stores doing business under 11 names, including Albertsons, Jewel and Shaw’s, hired a company to develop an energy management system where Supervalu would get paid for cutting back on load whenever required.. Of course, the management consulting firm got paid too. Reportedly, Supervalu expects an annual income stream of $400,000 by setting up their demand response system. With a sufficient package of bundled negawatts in hand, the aggregator may then be in a position to sell these negawatts to the regional grid operators. The regional grid operators view negawatts as the same as megawatts, in that they replace megawatts. Here we have nothing, i.e., negawatts, being sold for cash. It’s like being paid for not working. The danger in this scheme is at least two fold. First, a hidden load is being created. If anything prompts these loads to exit the scheme, the hidden load could be dumped on the grid without sufficient reserves to accommodate the load. This could happen if FERC changes its mind about allowing negawatts to be sold to grid operators. The proponents of negawatts are hoping the scheme becomes so pervasive it can’t be stopped. Aggregators are happy to be paid for selling nothing. It’s supposedly saving money by eliminating the need for investing in new power plants. It’s not clear; however, whether paying for negawatts is as costly as building a new natural gas power generation power plant at a cost of only $1,100 per KW. Second, there is a terrific opportunity for fraud. Whenever someone gets paid for nothing, there is a search to find nothing. What keeps an aggregator from not telling the truth, and selling more negawatts than it has actually accumulated? The Wall Street Journal reported that, Enerwise Global Technologies Inc. agreed to pay a $780,000 penalty for its role in an alleged scheme to get paid for fake reductions. Apparently, the state-owned Maryland Stadium Authority was coached to turn on stadium lights at Camden Yards when lights weren’t needed. Later in the day it got credit for cutting back power. Negawatts aren’t Megawatts. Negawatts are essentially nothing, yet current policy is allowing people to be paid for nothing. It’s also deferring the construction of new power plants which will have to be built after construction costs have risen. Negawatts are a dangerous innovation, and it’s not clear how to stop the scheme. My stand alone off grid solar & wind system has worked 24/7/365 with out a glitch for ten years now… Not one part has been replaced since I installed it not even one battery… I do not call that NEGAWATTS I call it free electric from renewable energy…. But my electric is not returned to the grid, nor would I ever consider such a stupid move…..Love 100% free electric daily & love no electric bill in ten years all the more……. Glad your installation is working well. Off the grid there will always be opportunities for solar and wind. For example, as mentioned earlier, Hawaii where there is a lack of fossil fuels, wind and solar may make sense. What doesn’t make sense is to play costly games with the grid just so expensive wind and solar can be used.